Especially trained and enforced figure skate player. His skating style has a unique rhythm, and his strength is one and only stepping! But he is very sensitive to the pressure, and always loses in the important games... It is already the fifth season as a senior skater. Moving from his home, he belonged to a skating club in Detroit, but he suffered a crushing defeat in his first Grand Prix Final, and he graduated from the university. So 5 years later he returns back to his home town, Hasetsu-Cho, Kyusyu. He bets everything into the last season which he is challenging against standing on an edge of a cliff! 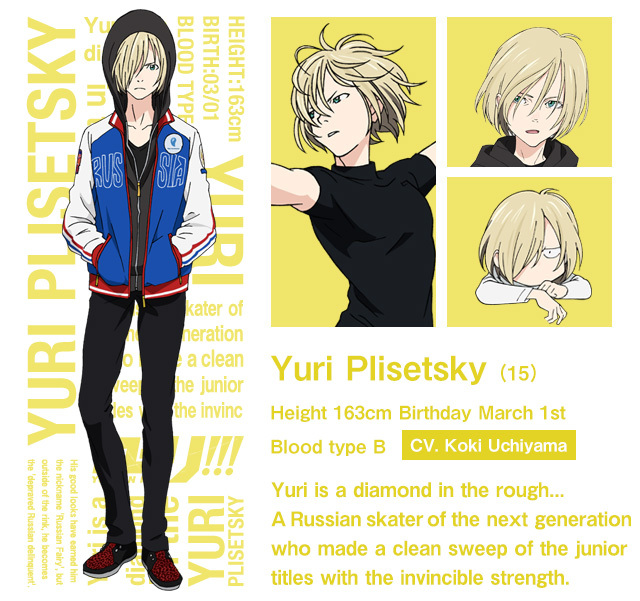 His good looks have earned him the nickname 'Russian Fairy', but outside of the rink, he becomes the 'depraved Russian delinquent'. 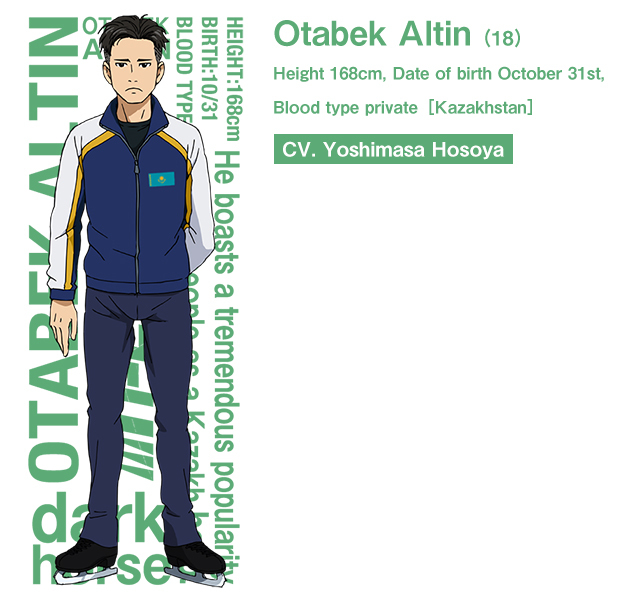 He is a fellow student with Victor with ambitious and believes deeply that he will win at his senior debut and become the best in the world. 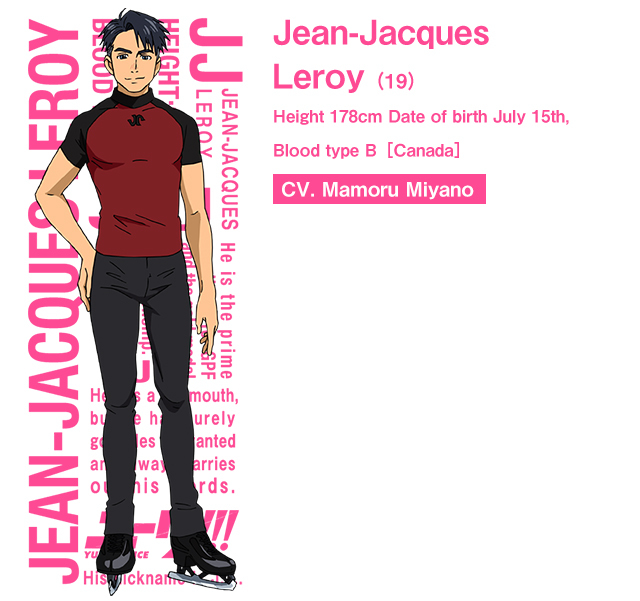 Through figure skating, he received help from his nation, and has admirably held the role of provider for his family since his rookie days. However, when he is playing in the game, his eyes are sharp and he plays enthusiastically. He is attractive in the way where he changes drastically. He is an athlete and is not familiar with fashion at all. 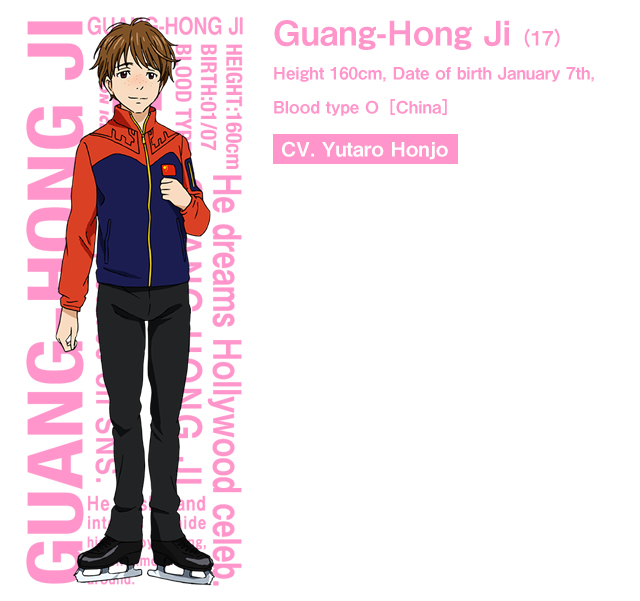 Although he is popular as a handsome skater, he does not like a woman and tends to contain his honest feeling. He thinks skating only and does not care about his fans at all. Pure-hearted, truthful, masculine, and gentleman. 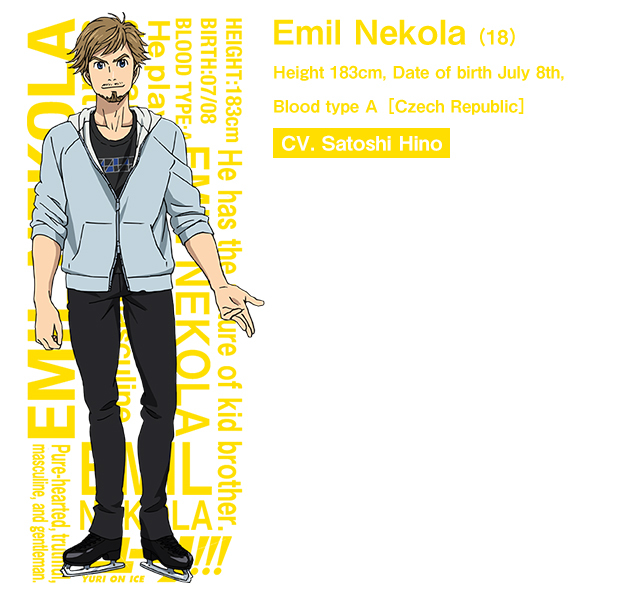 He plays a dynamic skating, likes extrem sports in the off-season, so makes the coach nervous. 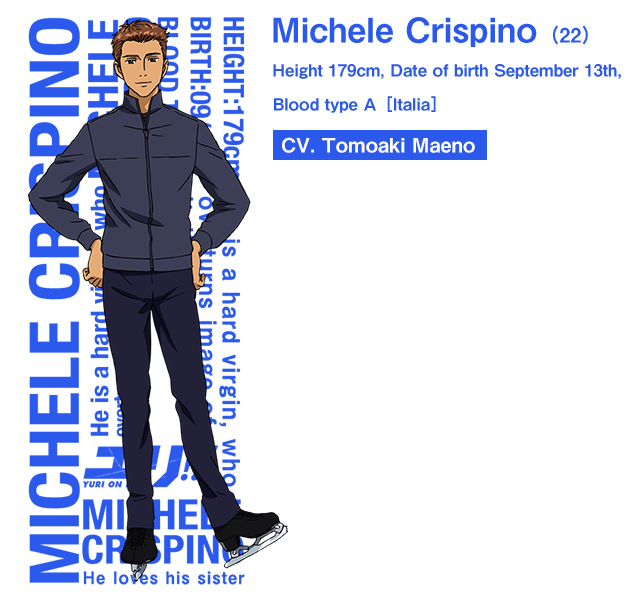 He is the type of person like henchman for Michele. He has the nature of kid brother. Not making his feelings shown outwardly, he only thinks stoically about skating. He is reticent and shy but his skating is eloquent. In last season's world championships, he made his senior debut and achieved 3rd place. In the grand prix series, this season is his first time to participate and he is the dark horse. 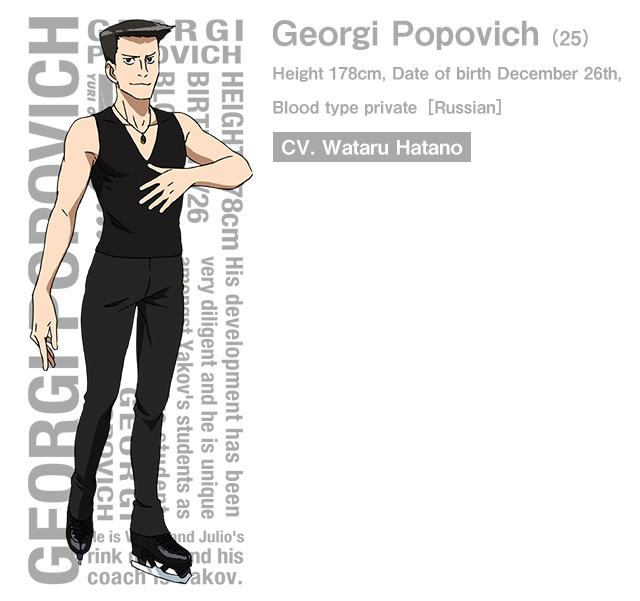 He boasts a tremendous popularity with the people as a Kazakh hero. 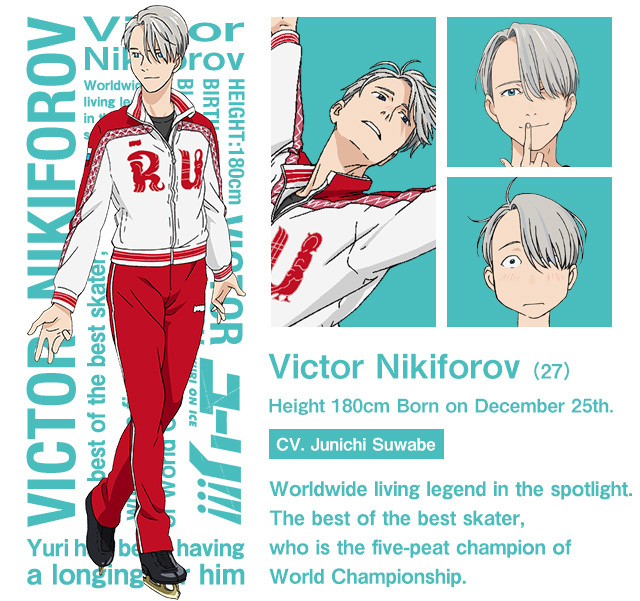 He is Victor and Julio's rink mate and his coach is Yakov. His development has been very diligent and he is unique amongst Yakov's students as a very effective student. He has an absolute confidence in his own artistic sensitivity. He saw the sunlight at last during Victor's season-long absence. He dreams Hollywood celeb. He bought a lot of clothes during the Canada camp in summer. 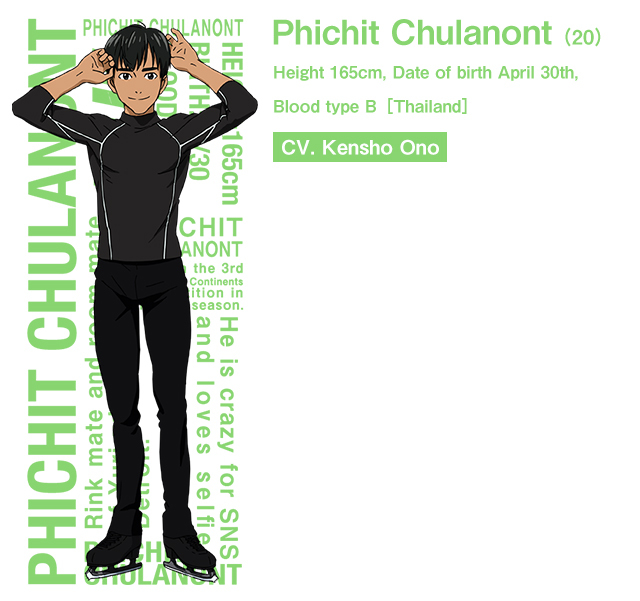 He yearns for his friend Phichit a little, and in the result he often uploads his selfie pictures on SNS. He is shy and intends to hide his fanboy feeling, which almost leeks around. His nickname is JJ. He has a big mouth, but he has surely got titles he wanted and always carries out his words. 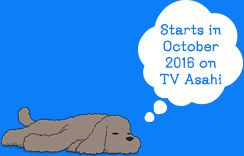 In the off-season, he is active in volunteers. 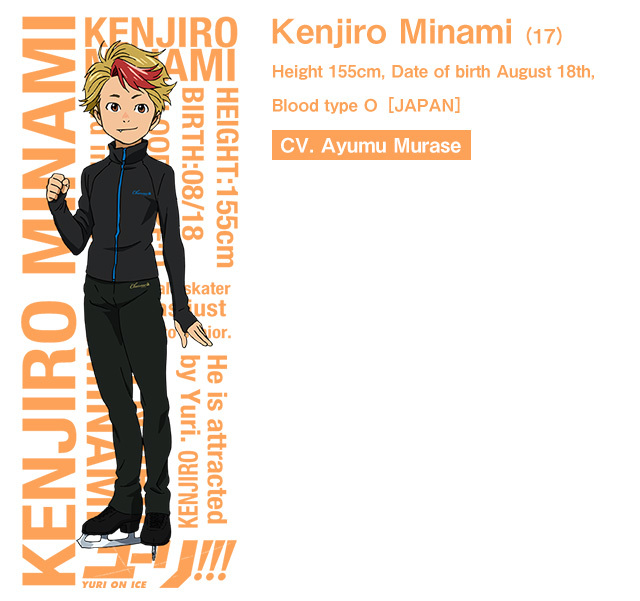 He belongs to figure skate family, because his parents were Olympic champions of ice dance, and also his younger brother and younger sister play in the junior cup. 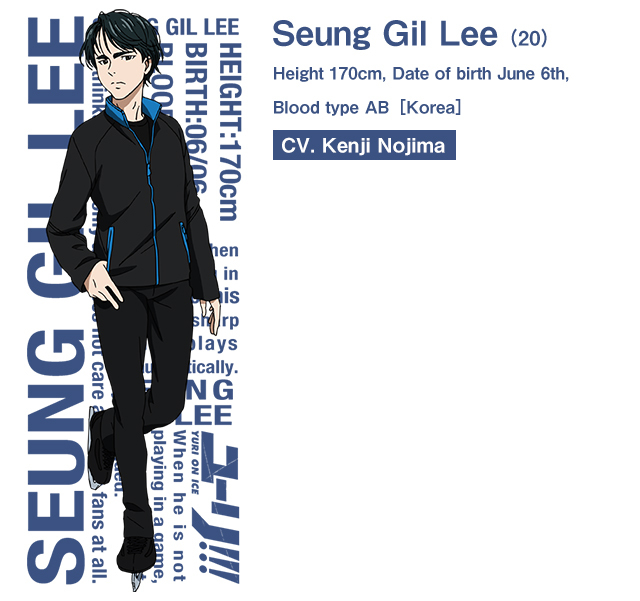 He is the prime candidate for GPF and the gold medal of the world championship. Rink mate and room mate of Yuri when he was in Detroit. He moved his rink to Bangkok in Thailand. He won the 3rd place in 4 Continents Competition in the last season. He is crazy for SNS and loves selfie. He is a hard virgin, who overturns image of Italian male. His twin sister, Sala Crispino, who is the world's fourth rank of lady's singles, always comes to cheer him. He loves his sister too much and has sent all of who approach her to the ”hell”. He looks bright and innocent. 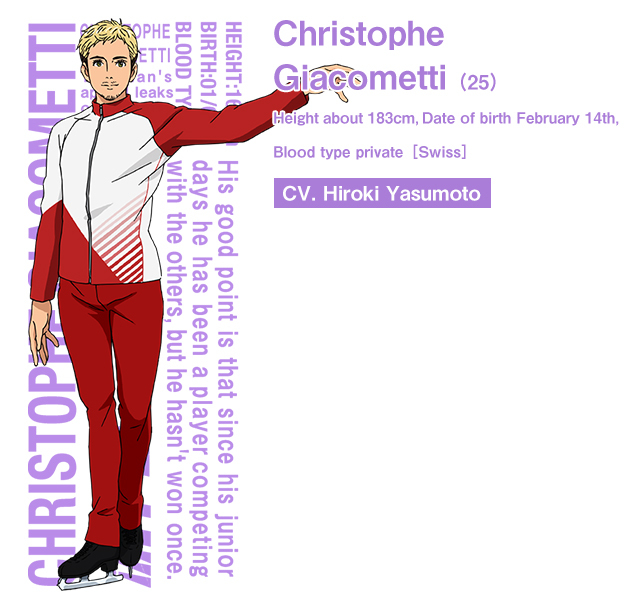 He is a male skater who was just promoted to senior. His parents are doctors and older brother is a student in medical college. He won the top place in All Nippon Competition last year. He is the skater whom people expect the most. 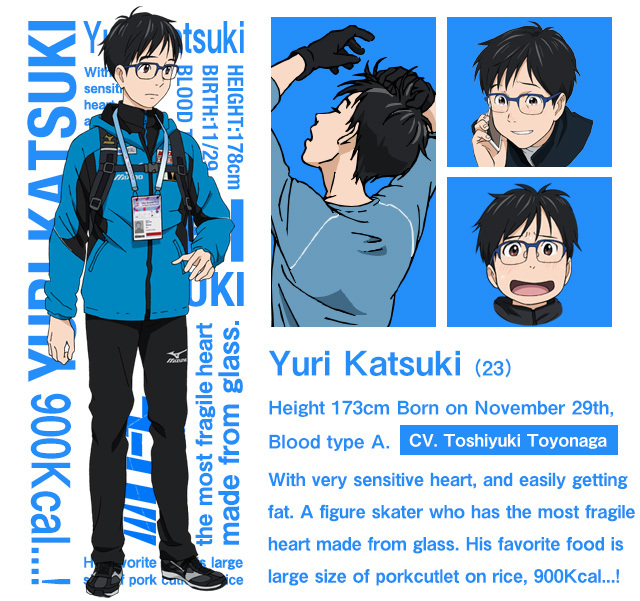 He is attracted by Yuri. 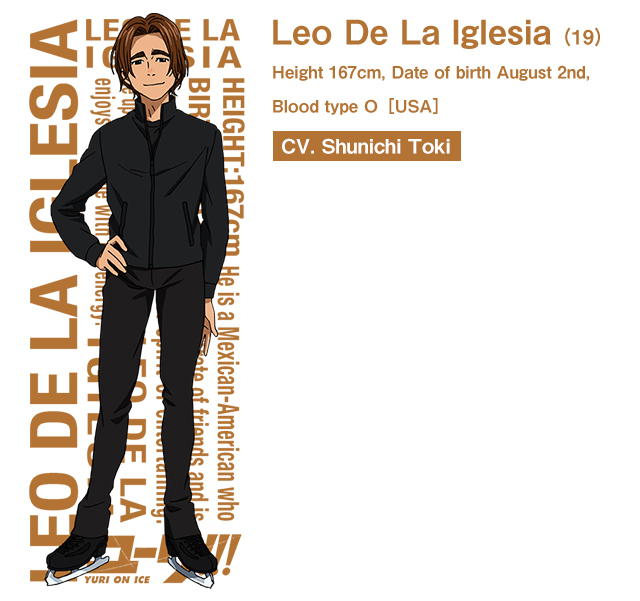 He is a Mexican-American who is considerate of friends and is full of spirit of entertaining. He takes care of choreography by himself and attracts audience with the program full of originality. He updates SNS frequently and always enjoys the game with full energy.